Comfort and gas permeability of sanitary towel are two of the key research subjects for manufacturers, also selling points that may attract consumers. The main indicators of the sanitary towel’s comfort include the ability to absorb and block the liquid, quick-drying and breathability. Those properties vary by different materials of sanitary towels. Generally speaking, the structure of the sanitary towels has mainly three layers: the surface layer, the absorbent layer, and the bottom layer. The surface layer is made of non-woven fabrics or perforated films, and it can quickly lead the liquid to the absorption layer so as to keep the surface dry. The absorbent layer is made of fluff pulp or water-absorbing polymer material, which absorbs liquid and prevents the liquid from flowing back. The bottom layer is mainly made of breathable PE material to ensure its breathability while preventing leakage. In this article, the moisture permeability of the substrate materials is discussed. The test specimens are the substrate materials of the sanitary towels from two manufacturers. 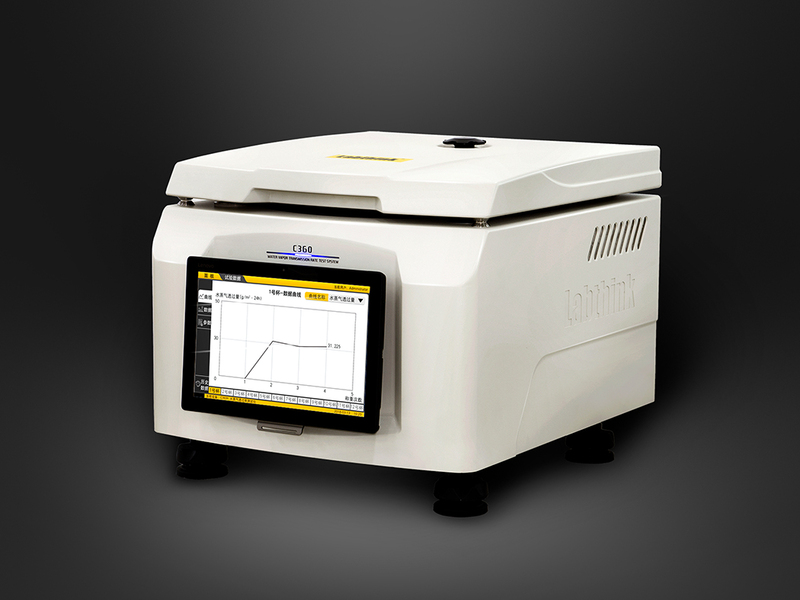 Testing instrument used in this test is C360M Water Vapor Transmission Rate Test System manufactured by Labthink Instruments Co., Ltd.
Cup method is also known as gravimetric method. The water vapor transmission rate is obtained by analyzing the weight change of the test cup over time. Add certain amount of distilled water or desiccant into the test cup. Then seal the test cup with the specimen. Control the humidity of the test chamber to form a humidity difference between the inside and outside of test. Due to the humidity difference, the water vapor will permeate through the specimen from higher humidity side to the lower humidity side and as a result, the weight of the test cup will be decreased or increased. By weighing the test cup periodically, the water vapor transmission rate can be calculated. C360M Water Vapor Transmission Rate Test System supports water method and desiccant method. The test range of desiccant method is 0.01 ~ 1,200 g/ (m2?24h). The test range of water method is 0.01 ~ 10,000 g/ (m2?24h). Six specimens can be tested simultaneously, which improves the testing efficiency. The test temperature of the test chamber can be controlled within the range of 15~55℃ ± 0.2℃. The instrument is equipped with high efficiency and mist-free automatic humidity regulator which can precisely control the humidity within the range of10%~90%± 1%RH. The desiccator has a long service life up to 20000 hours, meets the requirements for long-term continuous tests. The specimen size is Φ74 mm and the test area is 33 cm2. Air velocity in the test chamber is monitored and regulated in real time. Patented test chamber and test dishes with advanced fluid dynamics and thermodynamic designs ensure the uniform flow rate over the specimen surface, stable temperature and humidity, and create a uniform and stable testing environment. As a result, the test duration is shortened and the test results are more accurate. Unique, optional, DataShieldTM system, meets the requirements for centralized management of user data. It supports a variety of formats of exported data. Reliable security algorithms are used to prevent data leakage. It supports universal wired and wireless LAN, optional private wireless network, and supports third-party software. The instrument is applicable to determination of water vapor transmission rate of film, sheeting, paper and paperboard, textile and non-woven fabrics, etc. Films include plastic film, paper plastic composite film, geomembrane, co-extruded film, waterproof breathable film, aluminum coated film, aluminum foil and aluminum plastic composite film. Sheeting includes various engineering plastic, rubber, building material, insulation material, such as PP, PVC, PVDC and nylon sheeting. The instrument can also be used to test the water vapor transmission rate of building material, aseptic wound protection films and medical plasters, etc. The instrument conforms to multiple Chinese and international standards including GB 1037,GB/T 16928, YBB00092003, ISO 2528, ASTM E96, ASTM D1653, TAPPI T464 and DIN 53122-1. Add a certain amount of distilled water into the 6 test cups. Clamp the specimens on the mouth of the test cups, be sure to keep the surface which is in contact with the absorption layer of the sanitary towel facing the inside of the test cups, fasten the specimens with sealing rings, and screw the lids tightly. Put the test cups on the trays inside the test chamber of the testing instrument. Close the cover of test chamber. Set specimen name, test temperature, test humidity, weighing interval and other test parameters. Then start test. When tests are finished, the weighing results, temperature and humidity, and the water vapor transmission rate are displayed automatically. The arithmetic mean of 3 test results of each sample is taken as its WVTR. In this test, the WVTRs of the two samples are 601.4813 g/(m2?24h)and 1384.0073 g/(m2?24h). Sanitary towel substrate material’s moisture permeability is the key factor that influences its comfort and quick-drying ability. It can be concluded from the test results that the two samples have quite different moisture permeability. The difference in moisture permeability will affect the breathability of the sanitary towel. The testing instrument tested 2 samples at a time, greatly improves the testing efficiency. The testing instrument is easy to operate and provides reliable and accurate test results.